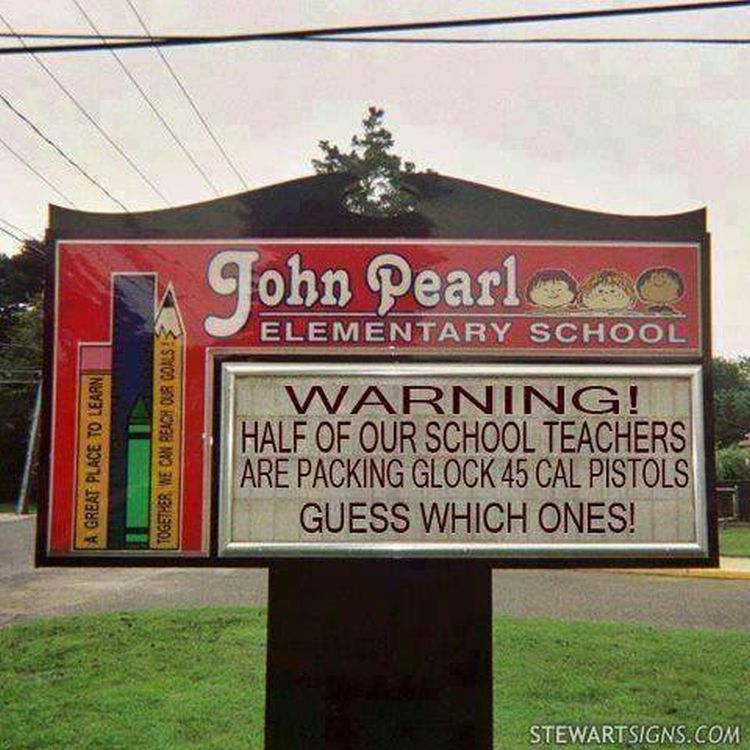 While I’m not sure that’s a real school sign it absolutely should be in front of every school in America. Republican presidential frontrunner Donald Trump said armed teachers could have protected the students who were killed in a mass shooting at a community college in Oregon this week. “This is in light of what’s gone on in Oregon,” Trump said Saturday during a campaign stop in Franklin, Tenn., after talking about his Second Amendment stance. “And by the way, it was a gun-free zone,” he said of the Umpqua Community College shooting Thursday. “I’ll tell you, if you had a couple of the teachers or someone with guns in that room, you would have been a hell of a lot better off,” he added. Chris Harper Mercer, 26, killed nine people and injured seven more before killing himself as police approached, law enforcement officials said Saturday. The killer, reportedly a gun collector who often went to a shooting range, was armed with three pistols and a semiautomatic rifle. The shooting has drawn another round of calls for background checks from gun control advocates.